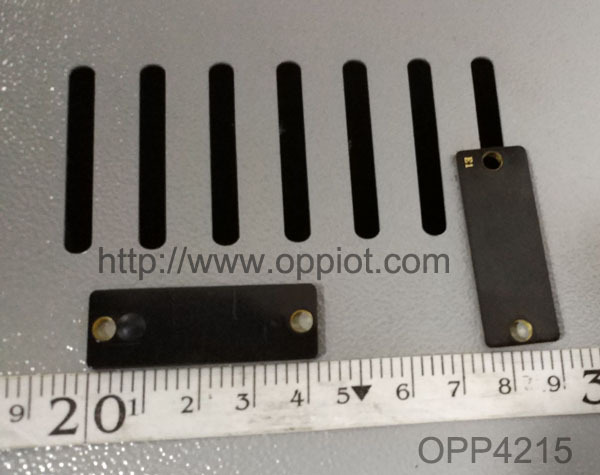 OPP IOT has released high temperature UHF RFID Tag OPP4215, which can withstand high temperatures as high as 280°С for 50 minutes, 250°С for 150minutes. With strictly technique, it can work accurately when subjected to the harsh industrial environment besides high temperatures, including pressure and aggressive chemicals. With sealed chips encapsulated into PTEF and copper material, the washable UHF RFID Tag is heat-resistant, waterproof and chemical resistant. The UHF tag OPP4215 can work perfectly to trace the object even when immersing in oil or liquid. Since its chemical resistant material enables it to avoid being destroyed by chemical etch such as acid and salt water. Complying with EPC Gen 2 standard, the RFID high temperature tag is durable and stable. these RFID UHF tag have proven to be able to survive harsh industrial laundry process including washing, ironing and pressing. Besides, its flexible design makes the high temperature RFID tag easy to attach to curved surface or rough surface. Thus, it can be widely used in production-line monitoring, supply chain management and other applications where heatproof property and durability are vital.